Holly is mobile and that means that I have a line of snot and dribble around the entire living room at exactly Holly's height. Ick. So when Rug Doctor challenged me to give their upholstery cleaning solution a try, I thought it was perfect timing. ick! Toddler snot and half-chewed biscuit. 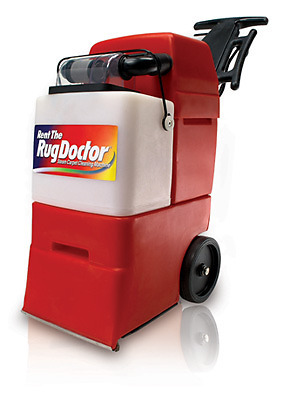 Rug Doctor loaned me one of their carpet and upholstery cleaning machines which you can normal find for rental in supermarkets, dry cleaners and sometimes hardware stores. They also sent me some of the Rug Doctor upholstery cleaning solution which is best used with some of their anti-foam solution as it tends to froth inside the machine a lot more than the carpet cleaner does. The upholstery cleaner came as an attachment which was very easy to put onto the machine. I filled up the bottom reservoir with hot water mixed with the upholstery cleaner and then used the hand-held vacuum over my sofas and curtains by squeezing the trigger to release some of the water mixture and then sucking it up with the brush-head. For me, the difference was instantly noticeable. I have risked putting my sofa covers through the wash in the past (when we were potty training Lara) but obviously it is impossible to put the arms of the sofa or the sofa base through the wash and they looked instantly improved. The vaccuum left the sofa arms quite dry (just a little moist to the touch) but by the time I got back from work in the evening they were completely dry and looking spotless. I will definitely be doing this again in the future as I think it has given my sofa a new lease of life... we had been previously considering replacing the sofa but it just seems such a waste when we KNOW we have another period of potty training and crayons and felt-tips to get through in the future. Being able to fully clean the sofa means that we can make our sofa stay looking good for a few more years. As we had the Rug Doctor machine with us, we decided to treat and clean the carpets throughout the house. We were already fans of the Rug Doctor urine eliminator from our potty training trials but we were also sent a bottle of the carpet detergent with spot blok which coats the carpet and protects it from staining in the future. I will honestly say that the Rug Doctor is the most effective cleaning machine I have ever tried (and very easy to use despite being incredibly heavy) and that the Rug Doctor carpet detergent was a LOT more effective at cleaning our cream carpets than my existing detergent although I think it would be even more impressive if I had pre-treated the carpet with Rug Doctor's Trafflic Lane treatment. One evening I cleaned the living room carpet and ran out of liquid in the machine with just one small area of carpet left to clean... I decided not to both cleaning it and tidied up for the night. The next morning I came downstairs and instantly noticed that the piece of uncleaned carpet looked black in comparison to the rest of the nice clean carpet! clean at the top, dirty at the bottom! I have enjoyed using the Rug Doctor. It is a lot more effective than my own small carpet cleaner and I think that for occasional use it is good value. I will probably continue to use my own small cleaner in between more serious 'spring cleans' using the Rug Doctor.